The manager administers; the leader innovates. The manager is a copy; the leader is an original. The manager maintains; the leader develops. The manager focuses on systems and structure; the leader focuses on people. The manager relies on control; the leader inspires trust. The manager has a short-range view; the leader has a long-range perspective. The manager asks how and when; the leader asks what and why. The manager has his or her eye always on the bottom line; the leader’s eye is on the horizon. The manager imitates; the leader originates. The manager accepts the status quo; the leader challenges it. The manager is the classic good soldier; the leader is his or her own person. The manager does things right; the leader does the right thing. 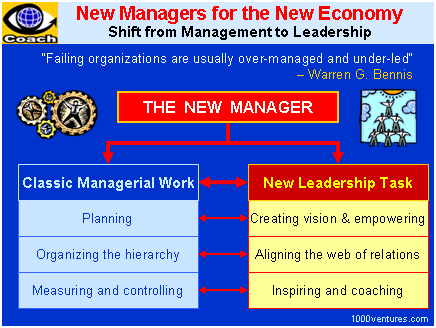 Perhaps there was a time when the calling of the manager and that of the leader could be separated. A foreman in an industrial-era factory probably didn’t have to give much thought to what he was producing or to the people who were producing it. His or her job was to follow orders, organize the work, assign the right people to the necessary tasks, coordinate the results, and ensure the job got done as ordered. The focus was on efficiency. But in the new economy, where value comes increasingly from the knowledge of people, and where workers are no longer undifferentiated cogs in an industrial machine, management and leadership are not easily separated. People look to their managers, not just to assign them a task, but to define for them a purpose. And managers must organize workers, not just to maximize efficiency, but to nurture skills, develop talent and inspire results. The management guru Peter Drucker was one of the first to recognize this truth, as he was to recognize so many other management truths. He identified the emergence of the “knowledge worker,” and the profound differences that would cause in the way business was organized. What makes the today leaders succeed? Every businessperson knows a story about a highly intelligent, highly skilled executive who was promoted into a leadership position only to fail at the job. And they also know a story about someone with solid—but not extraordinary—intellectual abilities and technical skills who was promoted into a similar position and then soared. Such anecdotes support the widespread belief that identifying individuals with the “right stuff” to be leaders is more art than science. After all, the personal styles of superb leaders vary: Some leaders are subdued and analytical; others shout their manifestos from the mountaintops. And just as important, different situations call for different types of leadership. Most mergers need a sensitive negotiator at the helm, whereas many turnarounds require a more forceful authority. The research results showed, however, that the most effective leaders are alike in one crucial way: They all have a high degree of what has come to be known as emotional intelligence. It’s not that IQ and technical skills are irrelevant. They do matter, but mainly as “threshold capabilities”; that is, they are the entry-level requirements for executive positions. But my research, along with other recent studies, clearly shows that emotional intelligence is the sine qua non of leadership. Without it, a person can have the best training in the world, an incisive, analytical mind, and an endless supply of smart ideas, but he still won’t make a great leader. Most large companies today have employed trained psychologists to develop what are known as “competency models” to aid them in identifying, training, and promoting likely stars in the leadership firmament. The psychologists have also developed such models for lower-level positions. And in recent years, I have analyzed competency models from 188 companies, most of which were large and global and included the likes of Lucent Technologies, British Airways, and Credit Suisse. The groups of capabilities can be put into three categories: purely technical skills like accounting and business planning; cognitive abilities like analytical reasoning; and competencies demonstrating emotional intelligence, such as the ability to work with others and effectiveness in leading change. To create some of the competency models, psychologists asked senior managers at the companies to identify the capabilities that typified the organization’s most outstanding leaders. 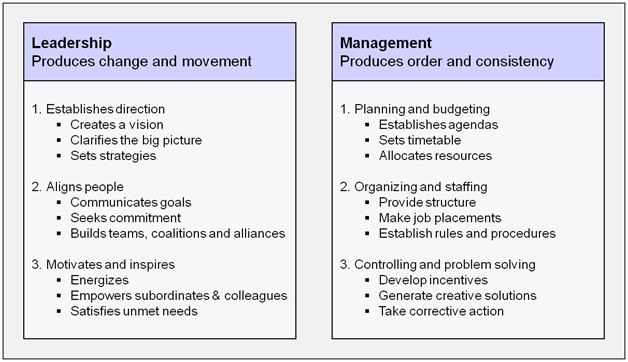 To create other models, the psychologists used objective criteria, such as a division’s profitability, to differentiate the star performers at senior levels within their organizations from the average ones. Those individuals were then extensively interviewed and tested, and their capabilities were compared. This process resulted in the creation of lists of ingredients for highly effective leaders. The lists ranged in length from seven to 15 items and included such ingredients as initiative and strategic vision. When Mr Daniel Goleman, the author of “The emotional intelligence” analyzed all this data, he found dramatic results. To be sure, intellect was a driver of outstanding performance. Cognitive skills such as big-picture thinking and long-term vision were particularly important. But when he calculated the ratio of technical skills, IQ, and emotional intelligence as ingredients of excellent performance, emotional intelligence proved to be twice as important as the others for jobs at all levels.